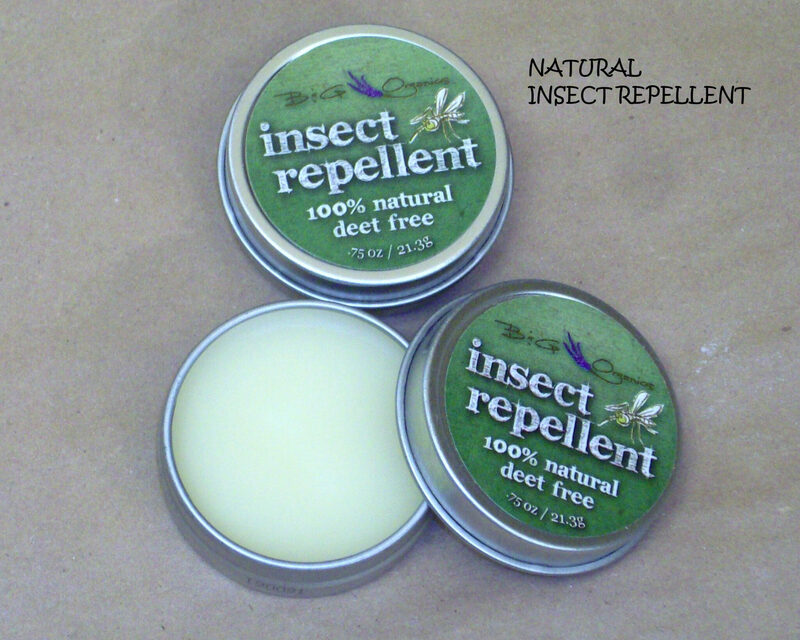 B & G Organics 100% Natural Insect Repellent in a .75 ounce tin that is handy to carry in your pocket, purse, Golf bag, etc. It is most effective when applied to the pressure points such as wrists, inside elbow, ankles, behind neck and knees. It is 100% Natural so you cannot apply too much. 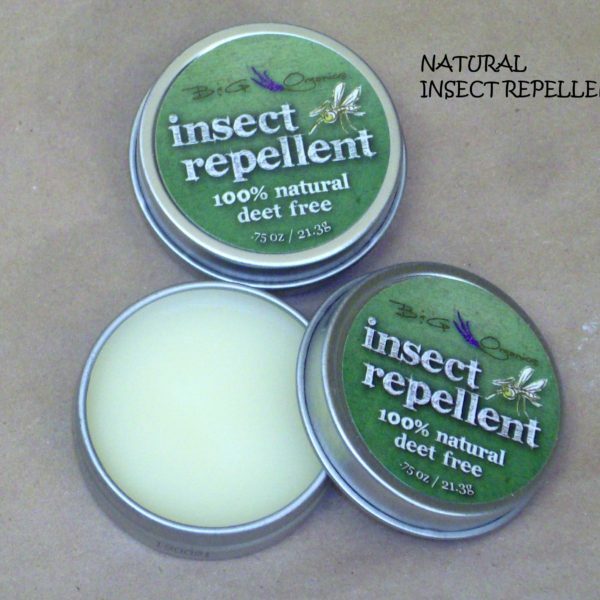 It contains no DEET and has natural ingredients that fight bugs naturally! Beeswax. Beeswax is used as the base for the Insect Repellent balm. It has skin softening and healing characteristics as well as antibacterial properties. Beeswax is a natural wax produced in the bee hive of honey bees. The wax is formed by the worker bees. It is estimated that bees collectively fly 150,000 miles, roughly six times around the world to yield one pound of beeswax. Beeswax is superior to petroleum based barrier creams when used as a base. Lemongrass Essential oil. Lemongrass Essential oil is an herb that belongs to the grass family of Poaceae. Lemongrass oil has a light and fresh lemony smell with earthy undertones. It is stimulation, relaxing. soothing and balancing. The compounds that make up Lemongrass Essential oil are known to have anti-fungal, insecticidal, antiseptic, and anti-inflammatory properties. Lemongrass may prevent the growth of some bacteria and yeast and it has antioxidant properties. Lemongrass Essential oil is used as a medicinal herb in India. Lemongrass Essential oil is a source of essential vitamins such as Vitamin A, B1, B2, B3, B5, B6, Folate and Vitamin C. It also provides essential minerals such as Magnesium, Phosphorous, Manganese, Copper, Potassium, Calcium, Zinc, and Iron. Lemon Grass oil is an effective cleanser for all skin types; its antiseptic and astringent properties make Lemongrass Essential oil perfect for getting even and glowing skin. It can sterilize your pores , serve as a natural toner, and strengthen your skin tissues. Cedarwood Essential oil. The health benefits of Cedarwood Essential oil can be attributed to its properties such as antiseborrhoeic, antiseptic,antispasmodic, tonic, astringent, diuretic, emenagogue, expectorant, insecticidal, sedative, and fungicidal. Cedarwood Essential oil is extracted through the steam distillation from the wood pieces of the Cedar Wood tree, which is the scientific name Juniperus Virginiana. Cedarwood is a plant native to cold climates and is normally found in high altitudes. Cedarwood oil prevents wounds from becoming septic as well as protecting them from tetanus germs. It can be applied externally on wounds as an antiseptic and it is even used as an ingredient in herbal antiseptic creams. By defending the body against toxins, the Cedarwood Essential oil relieves the white blood cells and immune system of the extra stress, which allows them to better protect internal functions. Cedarwood oil has been in use as a mosquito and insect repellent for a long time. When used in vaporizers, it drives away mosquitos, flies and other insects in a large area around the house. It is regularly sprinkled on pillows or sheets at night so mosquitos and other irritating bugs and pests are driven away while you sleep. Citronella Essential oil. The health benefits of Citronella Essential oil can be attributed to its properties as an antibacterial, antidepressant, antiseptic, antispasmodic, anti-inflammatory, deodorant, diaphoretic, diuretic, febrifuge, fungicidal, insect repellent, stomachic, stimulant, tonic and vermifuge substance. Citronella is a grass that mainly grows in some Asian countries and some islands of the South Pacific. It has a rich, crisp, lemony aroma and thus bears the name Citronella. The essential oil is extracted by steam distillation of the fresh plant. Citronella Essential oil is used as an insect repellent and is one of the most commonly used properties of Citronella Essential oil is it kills and keeps away insects. It has been effective on mosquitos, lice, body and head louse, and fleas. Rosemary Essential oil. Rosemary Essential oil is one of the most popular essential oils for its wide array of health benefits. It has become increasingly important and popular over the years as more of its various health benefits have become understood, including its ability to stimulate hair growth, boost mental activity, relieve respiratory problems and reduce pain. Rosemary Essential oil has antimicrobial and antiseptic qualities that make it beneficial to eliminate eczema, dermatitis, oily skin and acne. Topical applicatin of the essential oil helps in toning your skin and removing dryness. Wheat Germ oil. The health benefits of wheat germ include a boost to the immune system and a preventative measure against cardiovascular disease and cancer. Wheat germ has anti-aging properties, and can positively affect mental agility, muscle development, stamina, and rate for wounds. The nutrients in wheat germs can also aid in digestion, prevent damage to the arteries, and help in efforts to lose weight. Wheat germ is the small, nutrient-containing center of a wheat kernel, comprising only about 2.5% of the weight of the kernel, but packing a very beneficial list of attributes. Olive oil. Health benefits of olive oil include treatment for colon, breast cancer, diabetes, heart problems, arthritis, blood cholesterol, weight loss, metabolism,digestion, aging and cancer. Olive oil has been used by mankind for many centuries. It is a staple ingredient for many culinary and medicinal purposes. Medical studies suggest that olive oil is loaded with health benefits. Olive oil is used as an antioxidant and is readily absorbed into the skin.